Liberals, ever ready to strip Americans of their rights, are curiously anti-government when it comes to the realm of abortion. For some reason, those on the political left choose this sphere as one of the few where law-abiding citizens can make decisions for themselves. Despite labeling themselves as ‘pro-choice,’ so-called progressives are anything but. They are not pro-choice on freedom of association, freedom of speech, nor — most relevant of late — the freedom to own and bear arms. This article does not make a case for or against abortion; that is a much different debate for another occasion. But regardless of one’s political persuasion, the liberal hypocrisy on “choice” is as blatant as it is totalitarian. And there is no better way to completely expose this contradiction than a thought experiment applying the liberal logic used against anti-abortion laws to anti-gun legislation. Democrats, including presumptive nominee Hillary Clinton, often refer to abortion as a “fundamental right.” Fundamental rights are those that are inherent and stem from our existence as human beings. Such rights trigger what lawyers call “strict scrutiny,” the highest form of review in the United States. For the sake of argument, let us presume that abortions are a fundamental right. As of today, the Supreme Court has ruled certain restrictions on this right an “undue burden.” Essentially, the undue burden standard states that the legislature (state or federal) cannot make a particular law that is too burdensome or restrictive of one’s fundamental rights. Laws that limit the number of clinics (de facto or de jure) restrict access so much that a woman’s right is virtually useless. Liberals make a sound case, but their tune changes when it comes to a fundamental right that cannot be legitimately disputed. The right for the individual to keep and bear arms was secured by the framers of the Second Amendment, and confirmed by the Court in District of Columbia v. Heller. When the topic shifts from abortion to guns, political leftists suddenly favor all kinds of undue burdens. Restrictions on sale, ‘no fly-no buy’ lists, and outright bans are policies that do a great deal to infringe upon an individual’s fundamental rights. Could you imagine the hell that would be raised by the Democratic Party if the Republicans proposed a secret government list for abortions or staged an out-of-order sit-in to protect the “lives of the unborn”? Women often chide male politicians for having a stance on abortion at all. 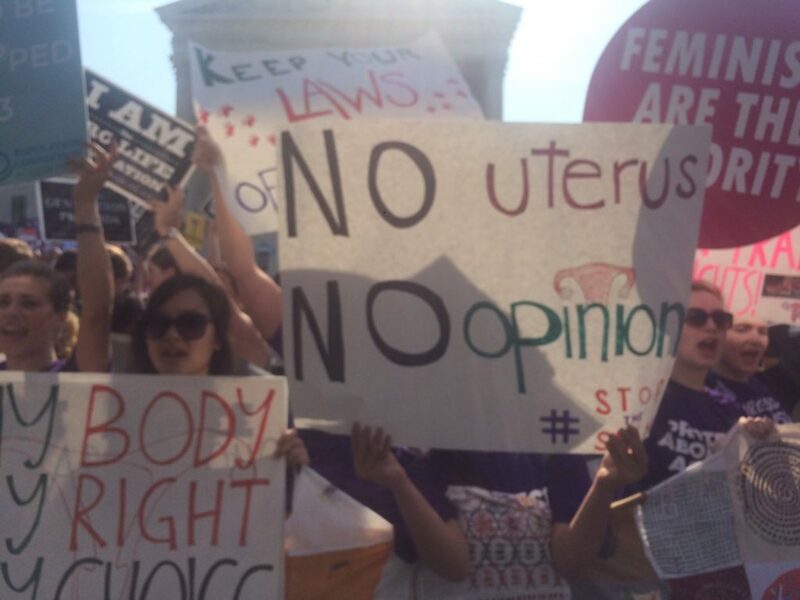 On the CNN coverage of the SCOTUS opinion this morning, the background was littered with protesters carrying signs such as “No Uterus, No opinion.” Again, that is a fine position to hold. But don’t you dare come telling me how to best regulate my gun if you do not even own one, let alone even know the difference between a semi-auto and a machine gun. Rights are rights, and the rules for one must be applied to another. This is in no way saying any right is unlimited, but undue burden is undue burden, whether we are discussing guns or gynecologists. I am fine with getting the “U.S. out of your uterus” as long as you get the Feds away from my firearms. If liberals want to support abortion, that is fine. But for goodness sake, be consistent.